Steve Jobs. Mark Zuckerberg. Albert Einstein. They each wear (or wore) essentially the same outfit every single day. Before his death, Steve Jobs was best remembered in his signature black mock turtleneck, jeans, and sneakers. The founder of Facebook, Mark Zuckerberg, typically wears a gray t-shirt with a black hoody and jeans. And Einstein reportedly purchased several variations of the same gray suit so he wouldn’t have to waste time deciding what to wear each morning. Johnny Cash is often remembered as the “man in black” while the author Tom Wolfe has been wearing his white suits since the early 60s. This article credits these same-outfit-wearing folks as having simplified their lives by helping to reduce their decision fatigue. While I don’t wear the same thing every day (I’m not sure my wife Elizabeth would go for that), I think there’s something to this idea of reducing or eliminating the choices we’re all faced with every day. I’ve written before about the value of constraints in financial planning, but that article was primarily about applying constraints to your investment decisions. 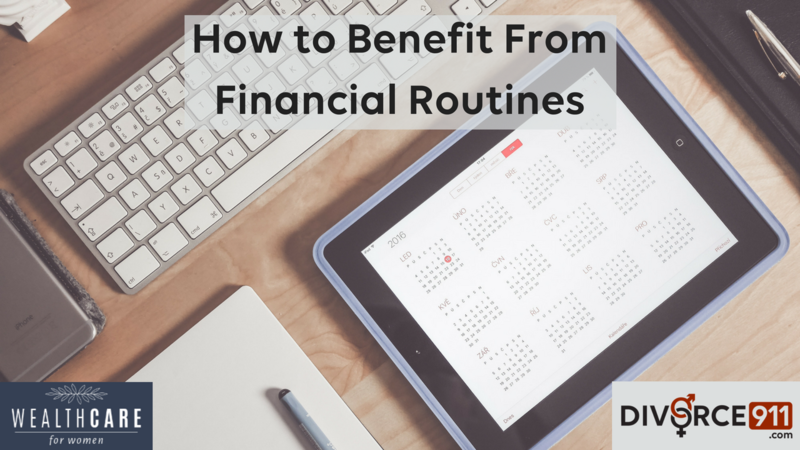 But there are other areas where I believe you can benefit financially from routines that reduce your responsibility to make decisions. “Automating your finances” is a great place to begin. As many of my clients will attest, I’m a big fan of automating things as much as possible when it comes to your finances. Here are some guidelines on how you might go about automating your own finances courtesy of Ramit Sethi. But automation can extend beyond how you divvy up your paycheck to savings, bill payment, etc. Through proper planning and a disciplined portfolio management process, you can have supplemental income deposited into your checking account on the 1st and 15th of every month, or whatever interval works best for you. Or if you want to begin paying down your mortgage ahead of schedule, simply setup and increase your automatic monthly payment with some of the extra applied directly toward principal. Sure, automated routines can help make your life easier and help you avoid missed bills, but that’s just the tip of the iceberg. Researchers estimate that an average adult makes 35,000 daily choices of varying degrees of significance. No amount of financial routine building is going to put a meaningful dent in that figure, but I think it’s as much about quality as it is quantity. Let’s say you get your latest paycheck deposited into your checking account. Do you make the minimum credit card payment? Do you save some into your IRA? Do you just let it sit in your checking account earning 00.001% interest or whatever measly interest rate your bank checking account pays you? And even if you’re disciplined and have a financial plan in place, some decisions can hit you at the worst possible time. Like when you’ve had a rough day (or week or month) at work and just want to go out and blow off some steam. Or when you’re dealing with an unexpected auto or home expense. Or when your high schooler neglected to mention the latest of what feels like a never ending stream of fees and expenses that need to be paid. And she’s in public school! As you might imagine, even the best of intentions can easily be waylaid by circumstances that are often outside your locus of control. Even when you know the best advice is “don’t just do something, stand there,” it’s much easier said than done when you’re faced with 35,000 choices a day. To combat this situation, I encourage you to build routines and put things on auto-pilot as much as you can. Whether that’s your wardrobe, your finances or something else, having some of these areas already addressed will hopefully free up some precious time for you to spend on more important things in your life.